Completely renovated, fully equipped apartment on the 2nd floor of the historical Dietrichstein - Donin building at Loretanska 3, just next to the Prague Castle in the exclusive district of Hradcany (literally few steps to the Prague Castle Square). The size of the apartment is 48 m2 / 516 sq ft and it includes a spacious living room with queen size bed, separate kitchen and bathroom and can accommodate up to 4 adults. It has 3 very large windows, 2 facing Loretanska Street with wonderful views on the surrounding palaces and 1 facing the quiet courtyard. New wood parquet floors give extra warmth to the apartment. There is a leather sofa, coffee table and a large flat screen TV with satellite. The dining area with a modern glass table sits up to 6 people. An office table with a chair is an ideal place to set up your laptop, FREE Wi-Fi internet access is provided. Lighting is set up through a combination of spot lights, chandeliers and lamps to create a warm ambiance. The apartment temperature can be regulated by the thermostat in the living room or individually on each heating element. There are all the amenities for demanding guests, including wireless internet, heated towel bar, washer, dryer, microwave etc. Should you wish, you can sit on the courtyard gallery in front of the apartment door and enjoy the sun. Or, you can take a walk to the nearby Prague Castle Gardens, Strahovsky Monastery Gardens, or the Petrin Park – it is amazing how much green space is just within a short walk. Enjoy the romantic atmosphere of the Prague Castle and its palaces that surround you - the Tuscany Palace, Martinic Palace, Schwarzenberg Palace (housing National Gallery), Archbishop's Palace etc. The Old Hradcany Town Hall is the adjacent building (see photos). Be just 2 buildings away from Hrzansky Palace where the Premier of the Czech Republic has his office and representative quarters. The Prague Castle Guard is just across the street. From the apartment window you can watch the guards marching to the Castle for the changing of the guards. Literally a few steps away at the edge of the Prague Castle, you have the most amazing view of the whole Prague... In the morning you can hear the Loreto’s bells with their wonderful melody....In the evening the quiet atmosphere with beautiful soft light of the old street lamps prompts you for a romantic walk. The Old Town is just a short 10 min tram ride or 15 min walk (take the Old Castle Steps and cross the Charles bridge). The Charles Bridge is about 10 minutes walk down from the Castle, the Lesser Town (Mala Strana) with St Nicholas cathedral just 5 minutes. There are many wonderful restaurants and cafes around, we will be happy to make recommendations. Our family loves PRAGUE! We travel frequently, but we think that this is the BEST CITY in the WORLD! We would like to share this special place with you - it is truly in the most magical location! We hope that you will enjoy it as much as we do!! The location is magical.... the property is unique as there are only a few apartments right next to the Prague Castle. We first experienced the uniqueness of this location while visiting a friend living in this building. It cannot be described, it has to be experienced! The proximity of the Prague Castle, the surrounding palaces and historical buildings and the quiet romantic atmosphere create truly a magical experience. The location is magical – especially in the morning and at night. In the morning, you can hear the beautiful sound of the Loreto bells... take a morning walk to soak up the atmosphere available only to you as there are no hotels in the immediate vicinity, no tourists around until later in the day... Take a few steps to the Prague Castle, to the lookout where you will see the roofs of the Lesser Town (Mala Strana), the Charles Bridge, the hundreds of Towers, the Old Town... Or you can go down the historic Town Hall Steps (Radnicke schody) leading to the picturesque Nerudova street with many restaurants, cafes, galleries and boutiques. In the evening have a romantic dinner at one of the great restaurants in the neighborhood, then walk in the soft light of the old street lamps back to the quiet Loretanska street and the apartment. toilet, shower, sink, mirror, heated towel rack, hair dryer. Towels, soap, bathroom tissue provided. Hair dryer. Cell phone is available for our guests. Incoming calls are free. For outgoing calls calling card can be purchased at any newspaper stand. 4 duvet covers, 8 pillows, large bath towels, small towels, face towels. Free high speed internet, wi-fi. Comfortable sofa, coffee table, dining table with 4 chairs, office desk with chair, lighting lamps, TV, satelite, stereo, internet. Full size refrigerator with freezer. Dishes, plates, cups, bowls, glassware, cutlery, placemats etc. Top quality ceramic stove top, oven, coffee maker, electric kettle, toaster. Satellite TV, major channels include CNN and BBC news. Terrace/Courtyard gallery with courtyard view and sitting bench. Outdoor terrace with seating next to front door to the apartment. Courtyard view. The apartment is located next to the Prague Castle and surrounded by many palaces - Martinic, Hrzansky, Schwarzenberg (housing National Gallery), Tuscany, Archbishop and many others. 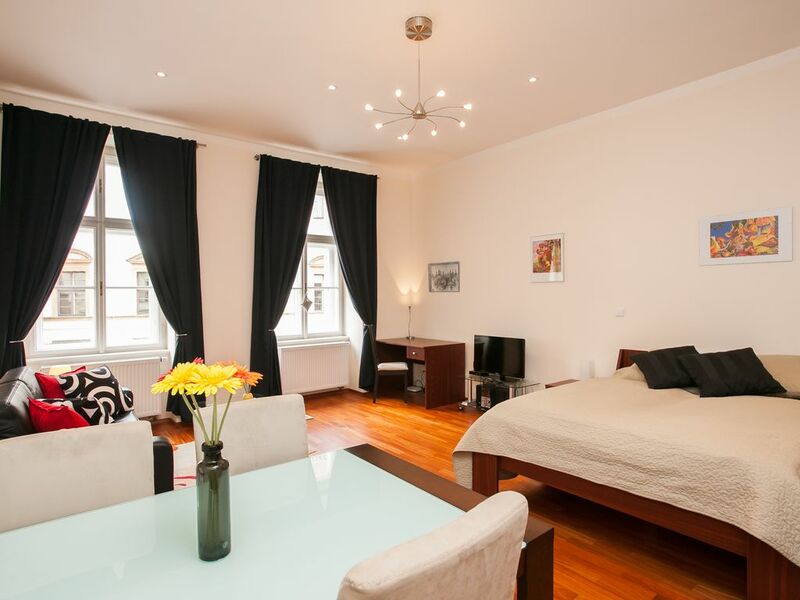 It is a short 3 min walk to Prague's famous Loreto, 5 min walk to Lesser Town (Mala Strana), 10 min walk to Charles Bridge and 15 min walk to Old Town and shopping district.Tram can be also used for comfortable and fast access to all major attractions, restaurants and shopping. There are many museums in the Prague Castle area, galleries (National Gallery, Baroque Art, Permanent Exhibition of Sculpture and Painting, Imperial Armory etc.). There are also frequent classical concerts in the concert halls and churches of the Prague Castle.